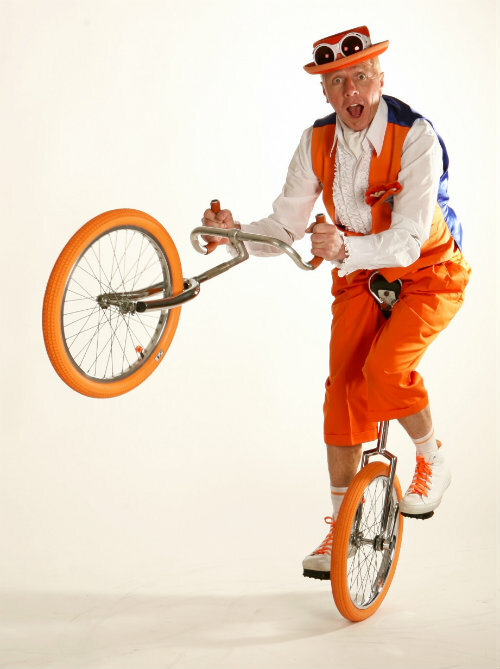 I love riding bicycles for pleasure on road and trail and I particularly love performing with them so this is a whole page dedicated to them. 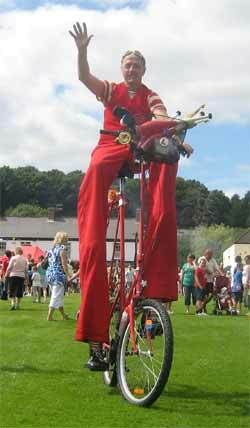 Stilt Bicycle. 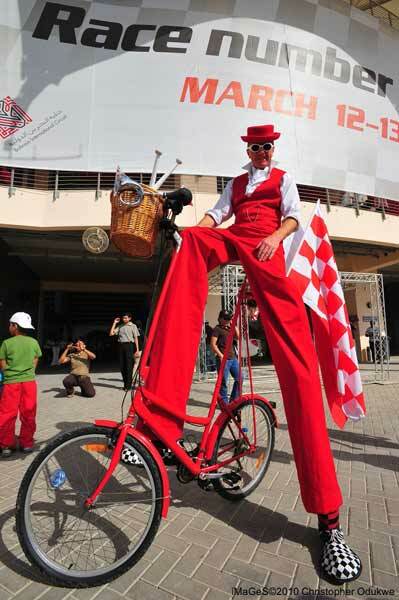 A specially (ridiculously) adapted bicycle ( it was a tall order...), standing over 6 feet high and currently bright red. 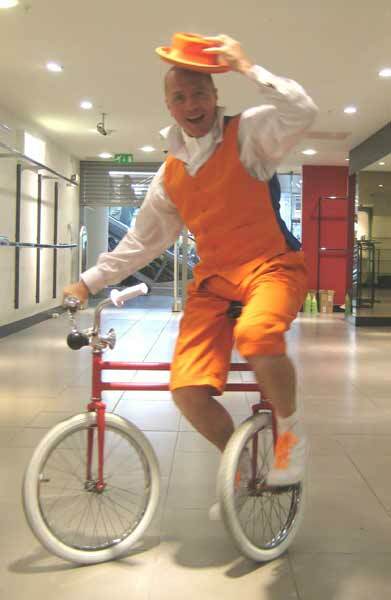 The effect is absolutely stunning and perfect for parades, cycle/green events and large sites, I have also used it to great effect in several shows for the circus of light where I rode it around a Dickensian theatre! It also enables me to cover a huge area in an extremely groovy and visually superb way if required! For night time, ‘light up’ and festive events, the bike can be covered in super bright LED lighting this makes for a truly spectacular sight. Flags can also be fitted which look amazing as I ride by. 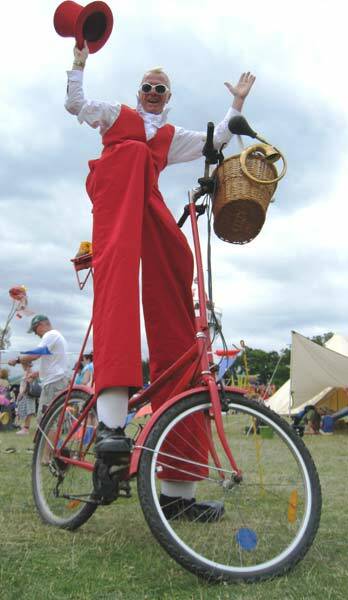 I can at any time dismount to perform as a stilt walker and to juggle and clown about; a basket can be fitted to the front or a case to the back to carry props, giveaways and information. New for 2017 is a splendid rear mounted powerful bubble machine! 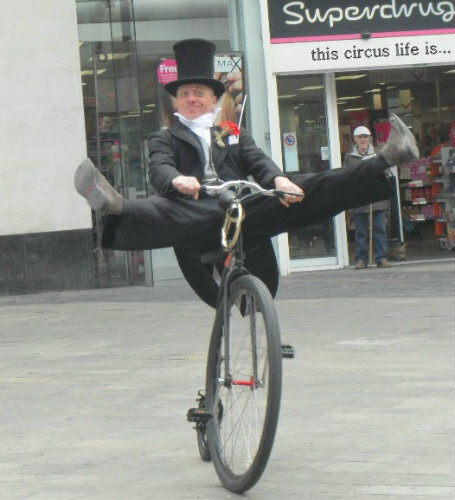 Penny Farthing. 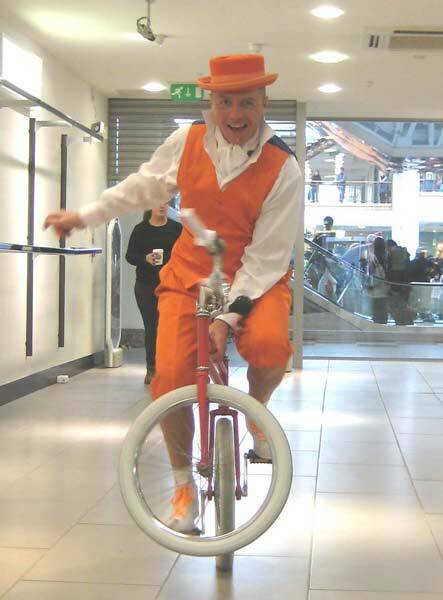 An authentic re production machine with a 36” front wheel, the size makes it safe to use in a crowded area whilst still creating great excitement. It can be used for all kinds of characters but is especially good with a Victorian gentlemen, Victorian policeman or Dapper chap. 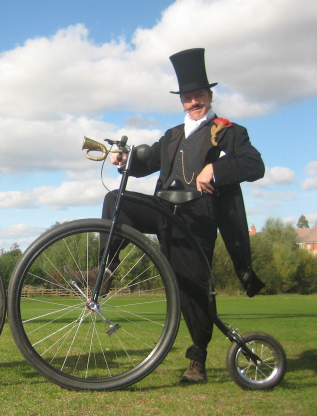 The Penny Farthing can also be festooned with LED lights for dark evening events and parades. 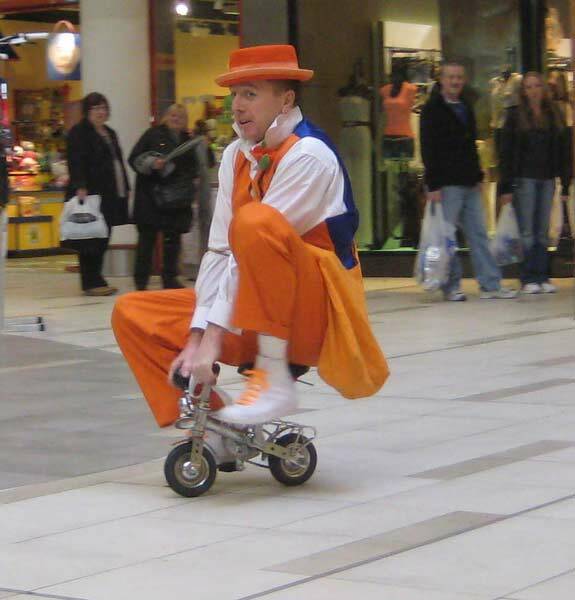 Teeny Tiny Micro Bike. 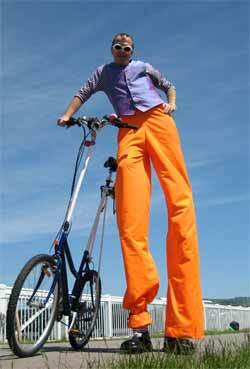 Upright it stands approximately 12 inches above ground level and around 18 inches long - a very small bicycle indeed! 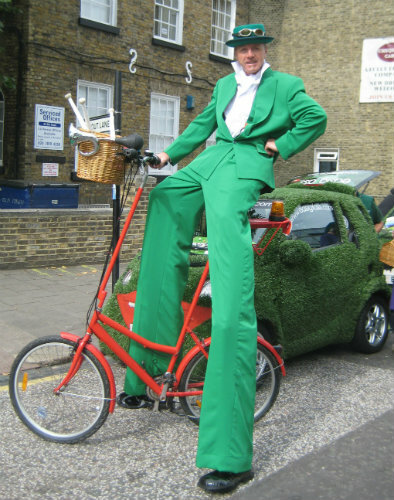 Tremendously effective on its own and in conjunction with the lofty stilt bike. 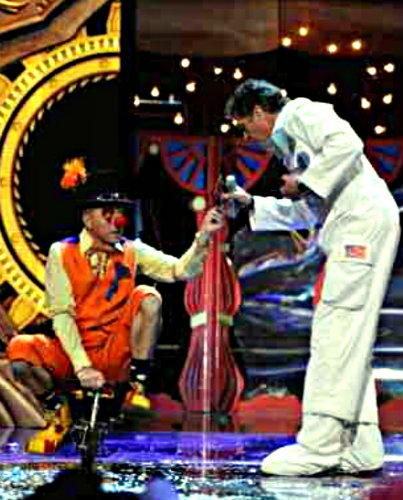 Teeny Tiny Micro Tandem. 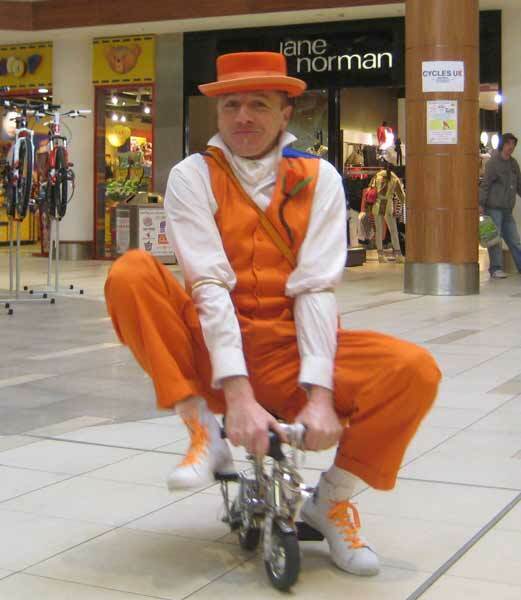 A very small bicycle… for 2! The Luni Bike - (L(a) Uni Bike) A curious machine designed by those crazy French folks, the handlebars spin and so does the seat and the wheels are very close together making some rather interesting tricks and riding positions possible, can be ridden very slowly, forwards, backwards and turned on the spot so is fine and safe even in a crowded area, great for clowning and bicycle events plus a real eye catcher for promotional applications, It is currently bright red with white tyres but can be painted any colour! 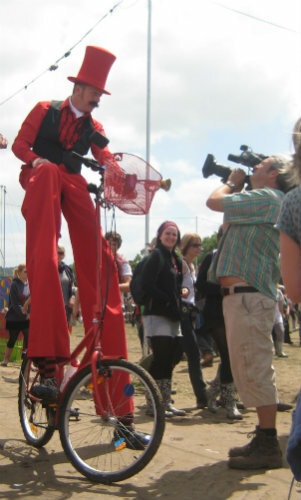 I can also carry a tubular bag with juggling balls and a diabolo for impromptu shows.